The public relations industry is undergoing a revolution in using data to define promotional programs, to measure influence and to address the needs of clients with more precision than ever. Applying tools that range from online surveys to social-media listening to applying big data with sophisticated algorithms, today’s PR professionals are data-driven in virtually everything they do. 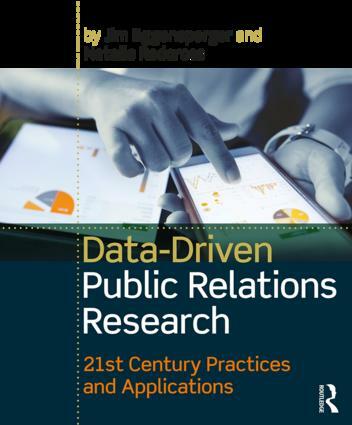 Data-Driven Public Relations Research is the first book for PR students and practitioners to offer an overview of these new practices as well as a glimpse into the future of these new applications, including "big data" and some of the applications from real-world PR campaigns and strategic planning. It includes contemporary cases involving brand name companies who are blazing new trails in the use of metrics in public relations. This book presents a practical, accessible approach that requires no prior training or experience, with easy to follow, step-by-step measurement examples from existing campaigns. Using Excel, the book enables readers to export lessons from the classroom to the office, where use of statistical packages is rare and can give PR practitioners the advantage over competitors. How to manage major projects with specialized research firms. Accompanying electronic resources for the book include sample answers to the book’s discussion questions, PowerPoint lecture slides for instructors and sample research exercises using Excel. Jim Eggensperger teaches at Iona College in New Rochelle, NY, and has previously worked as a PR practitioner for clients such as Ernst and Young, Xerox and IBM. Natalie Redcross began her career as a reporter, editor and, later, a K-8 teacher. She currently teaches in the Mass Communication Department at Iona College in New Rochelle, NY. She has worked in the theater arts, education and nonprofit arenas as a PR specialist and consultant.